In Nigeria, there would be pieces in different pots by now! Lol. 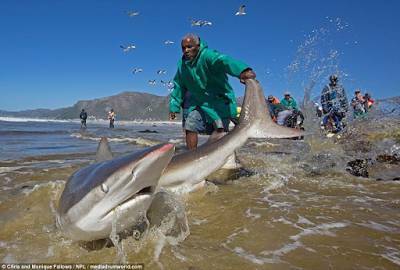 Images taken on Muizenberg beach, Cape Town, show a group of fishermen struggling to release a huge shark - the Bronze Whaler, into the sea. 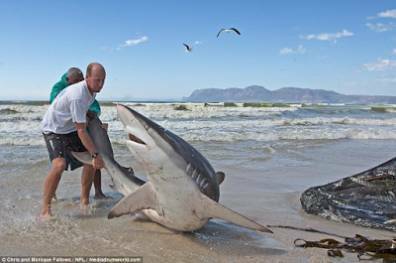 The potentially deadly predator which measured a huge eight-foot-long and weighed approximately 500 pounds, was caught up in a traditional seine net and they wanted to release it back into the sea. 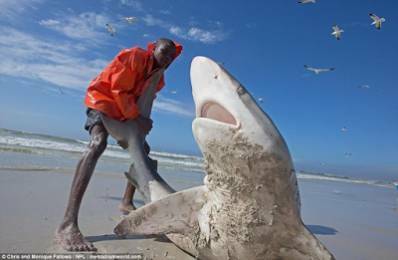 With a mouth full of razor-sharp teeth, the giant beast tried lunging its mouth towards the fishermen, who stood strong and continued pulling it back into the sea. After the tussle, they eventually succeeded. 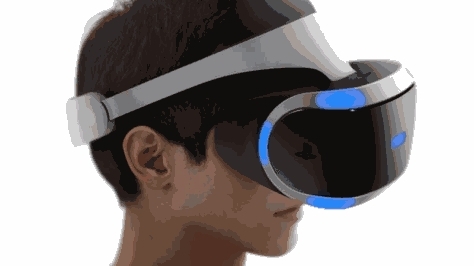 Continue to see more photos.